After two years, the District Attorney has decided not to press criminal charges against Officers Eric Reboli and Craig Tiffe, who shot Amilcar Perez-Lopez to death on the night of February 26, 2015. District Attorney George Gascón, who has yet to bring charges against any officer of the SFPD, released a 25 page summary of the investigative report laying out the rationale for his decision. To support his position, the DA also released a 3-D Animation which purports to be “an attempt to recreate the events that transpired on the evening of February 26, 2015.” Not quite accurate. Even the DA acknowledges that the Animation is a recreation of events from the point of view of Officers Reboli and Tiffe. Remember, officers are legally entitled to use deadly force if they perceive that their life or that of another citizen’s is in danger. Perez Lopez was shot in the back, the autopsy shows. So the investigation must answer the basic question that has hung over the case from the beginning: If a man is shot in the back, how can he be threatening the life of the shooter? In answering it, both written and animated versions rely on the testimony of Charles J. Key, a former Baltimore police officer who now provides services as a Consultant, Use of Force and Ballistics Expert. The animated version suggests the Officer Reboli is firing at a ghost, but he hits a real person. He may have not known the specific position, yet he hits Perez Lopez five times with five shots. OK, say Perez Lopez quickly turned his back as Officer Reboli began to shoot. Was he still holding the knife? The testimony is mixed, although the DA believes he probably was. Why? In part because the second officer, Tiffe, says he saw Perez Lopez raise the knife after Reboli started shooting. Tiffe then shoots Perez Lopez in the back, not because he, Tiffe feels threatened, but because he thinks Perez Lopez might be going after the guy he had been chasing around (Abraham P., who Tiffe can’t see). So the problem of how Perez Lopez could be threatening the officers as he moves away from them is solved. Either one officer feels personally threatened and shoots Perez-Lopez in the back because his reaction time is too slow to account for the turn, or the other officer shoots Perez-Lopez in the back because he feels Abraham P., is threatened. This is the defense the officers make, and it is enough to convince the DA they didn’t break the law, and the latter is his only mandate. Throughout the summary, the DA notes contradictory evidence such as witnesses who heard the knife fall before the gunshots, but he is not persuaded by it. In his report, the DA is also not concerned about SFPD policy: if it was followed or if it needs to be changed. But it is difficult to watch the animation without being struck by exactly that question. Once on the scene, the officers escalate, rather than de-escalate the incident. According to his statement and the Animation, Officer Tiffe approaches Perez Lopez and tells him to get away from the car. When Perez Lopez doesn’t comply, Tiffe escalates. This decision touches off a chain of events that quickly spirals out of control and ends with Perez-Lopez dead on the pavement with five bullets in his back. 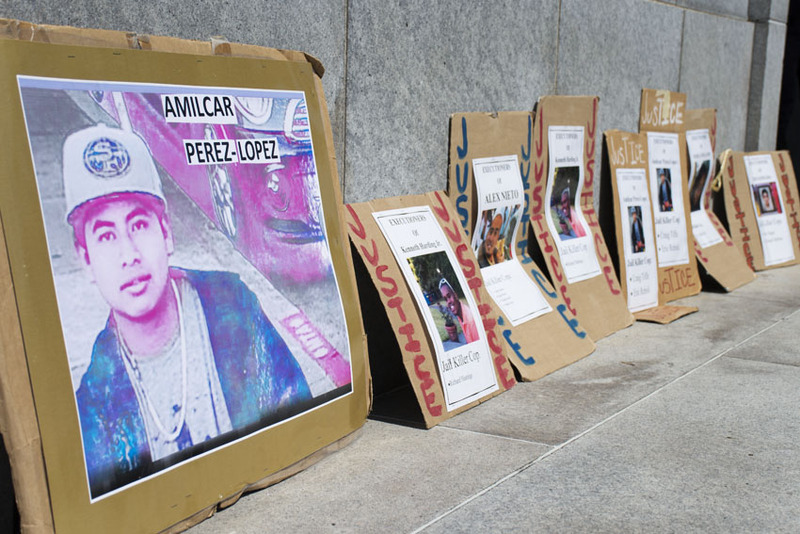 So after 777 days, the criminal investigation into the death of Amilcar Perez Lopez has come to an end. Maybe you are wondering WTF; what takes so long? And if you’ve read the SFPD Department General Order 8.11, which “outlines the rules and procedures to be followed in the conduct of all officer-involved and discharge investigations, “ you would expect these cases to wind up much sooner. The Order gives the Homicide Detail 45 days, and the Internal Affairs Division 60 days, to complete their investigations. After the December 2015 slaying of Mario Woods in Bayview, three reviews of the SFPD Use of Force policies and practices ensued. The first issue to be addressed was the timeliness and transparency in lethal Officer Involved Shooting (OIS) investigations. This review was carried out by San Francisco’s Civil Grand Jury. Established by the State, the Civil Grand Jury is a government oversight panel of volunteers who serve for one year. It scrutinizes the conduct of public business of county government, makes findings and recommendations which result from its studies. In its report, the Grand Jury concludes that not only did investigations of fatal police shootings take too long, but also that the citizens of San Francisco are not provided enough information to feel certain that the OIS investigation process works properly and that the results of such investigations are fair and just. And, once again, Gascón has made it clear that the public will not have access to the full report. Each OIS investigation involves the following agencies and units: SFPD Homicide Detail, SFPD Internal Affairs Division, the Medical Examiner, the Office of Citizen Complaints (now the Department of Police Accountability), and the District Attorney. Each OIS investigation is basically two-pronged: a criminal investigation to establish whether any laws have been broken, and secondly an administrative investigation to determine if the actions taken by the officers comport with SFPD policy. The SFPD General Orders are the policy foundation of the Department, often referred to as the “Bible” of the SFPD. Following General Order 8.11 (remember?) OIS investigations should be concluded in less than six months. Attorney’s office, can take up to two years and longer. The administrative investigation, mainly run by the Internal Affairs Division of the SFPD can take up to 30 months, but cannot be complete until the criminal investigation is complete. no investigation has met the timeframes set forth in the SFPD General Orders. Even the average figured by Budget Analyst Harvey Rose, 445 days to close a case, has only been reached once during that time. Though the Civil Grand Jury makes no analysis as to why investigations routinely take so long, it does offer a number of findings and recommendations, mostly bureaucratic in nature, such as streamlining communications, standardizing reports and giving a shout out to the Medical Examiner for drastically reducing the delays it was routinely causing. The Grand Jury also recommended better public communication by the investigators, providing regular updates on the investigation of individual cases. Among its findings, the Grand Jury found that the District Attorney’s office was the main bottleneck in criminal investigations. Timeliness is important to the process, but the Civil Grand Jury is most concerned with the issue of “transparency” – or who’s investigating whom? The lead agency in the investigations is the SFPD Homicide Detail. Taking the lead means in practice that officers from the Homicide Detail are the first to examine the evidence and importantly, the first to interview the shooters and other witnesses. Although the Grand Jury believes this system was set up with the best of intentions, it recognizes that the SFPD investigating itself may cause a public perception of bias in favor of the officers under investigation. Also feeding a negative perception is the unbroken record chalked up since 2000. Between 2000 and 2016, there were at least 97 officer-involved shootings, 42 of them fatal. No charges have been filed against officers in any of the shootings. The political relationship between the DA’s office and the SFPD doesn’t help either for greater transparency or timeliness. In the case of Perez-Lopez, DA Gascón blamed the police for failure to immediately inform and moving the body before DA investigators arrived on the scene. To address these problems, and above all transparency, the Civil Grand Jury proposes the City create a new multi-agency Oversight Task Force which would monitor an OIS investigation from beginning to end. The Civil Grand Jury also proposed the DA’s office get increased funding and resources for improved investigations. Recently the DA announced the formation of an Independent Investigations Bureau inside the DA’s office. The “independence” in its title seems to refer to its independence from the other pressures within the office. In addition to faster investigations, the DA believes the Bureau will supplant the SFPD Homicide Detail as lead agency in OIS investigations. This has yet to be agreed to by the SFPD. There is also some dispute as to how much funding the Bureau will receive and what its actual mandate will be. For more on the Civil Grand Jury report, go here. OK, the Civil Grand Jury came down on the DA. Not to be outdone when it comes to dinging the cops, the DA commissioned the Blue Ribbon Panel on Transparency, Accountability, and Fairness in Law Enforcement. Focused on the question of institutional and individual bias in the SFPD, the Panel spent little time on the question of OIS investigations in its July 2016 Report. The Panel did report, however, that “investigations conducted by the District Attorney’s Office suffer from a lack of independence . . .” meaning the DA was too dependent on the Police. As for delays, no surprise here, the Panel blames the Police. The Panel offers no specific recommendations to improve either the timeliness or the transparency of the investigation process. Finally, the most extensive review of last year, and the one that carries the most weight, is the review jointly conducted by the SFPD and the U.S. Department of Justice.The fruit of that collaborative effort is “An Assessment of the San Francisco Police Department” (hereinafter “the Report”). It was issued in October 2016. As is the case throughout the Report, the section on OIS investigations relates in mind-numbing prose the procedures, protocols and policies of the five agencies involved. And then, with considerable less detail and considerably more ambiguity, the Report gets into how it goes down in practice. The Report makes a number of other, mainly bureaucratic, recommendations such as the development of a checklist and a template for files. Sounds innocuous enough, although one has to ask why no such protocol exists. But the underlying issue is, as we have seen, intensely political: who leads the investigation? Who do you trust? Simple, clear protocols can be useful – if they’re followed. WHAT???? They don’t have a policy for investigation standards? Do we dare ask what standards they’ve been using? Any? All of this makes the details of this – and all reports – important. But, Gascón’s office has said those details will not be made public. So, no transparency and a lot of wondering – a situation that does neither the SFPD or the community a lot of good. Mark Rabine is a long-time collaborator of Mission Local who is married to the executive editor, Lydia Chávez. For the last couple of months he has been delving into the myriad reports on police violence and he will be writing more on policing the Mission. So Mission Local, why not file an open records request for the full OIS report? If it’s denied, then you go to court and let a judge — someone independent of this whole process — get involved. That can only be a good thing. When do we hold Amilcar Perez-Lopez accountable for his actions that resulted in these two officers forcing shooting him? If he wasn’t chasing someone with a large knife he’d be alive today. At some point we need to relaize that officers do not wake up in the morning thinking they are going to go out a shoot someone. They are only reacting to what is happening to them in the community and if someone is chaising somone else with a knife and is endagering the community then the officers need to do somehting to protect the community from violent indivduals. You might not was to hear this by Amilica Perez-Lopez was a danger to the community. He was running down the street with a knife intent to do harm to another person. He is responsible for what the officers did to him and he paid the price for his actions. Sure, if you buy the official police version and discount eyewitnesses’ versions. As for holding Perez-Lopez “accountable,” uh, he’s already dead.